Cement Creek Campground is a Forest Service facility maybe 3.8 miles up Cement Creek Road, also known as Road #740, off of CO 135 out of Crested Butte South. The road is dirt, but apart from a little washboarding here and there it’s fine and fairly wide. I wouldn’t want to take a Class C or A rig much larger than 30′ into the campground however because the campground loop is narrow with tight turns. Also, at less than 11′ in height there was a small tree limb in contact with the roof of my rig. At first I thought I was hearing some cute little animal calls but it turned out to be the branch screeching on my roof. 2014 Rate: $14.00 with a 50% discount off that given to pass holders. This is a seasonal campground, late May to late September. Check with the Forest Service or concessioner for exact dates dates of operation. The Forest Service web site says there is potable water but I didn’t find any. The only spigot I found was missing the valve handle and was covered with a black plastic trash bag. The campground host says the Forest Service web site is old and incorrect, that the county won’t certify the campground’s water as potable, so, NO WATER other than the creek. Firewood was available from the campground host for $6 a bundle when I was there, but the hosts didn’t seem to be around much. They had responsibilities at a number of other campgrounds, so sometimes they are not around. There is no cell service at Cement Creek campground. The Forest Service web site says the campground is “Operated By: Concessionaire – Recreation Resource Management of America, Inc. Arizona Corporate Office 1-928-537-8888”. I’m uncertain of what use that information might be since sites are not reservable. Campsites here cannot be reserved: first come, first served; 14 day stay limit. There is no phone number to call to inquire about availability as far as I know. You just have to show up and take your chances. I arrived midweek, fairly early in the day, in late July and there was really only one space available that was suitable for my rig. The Forest Service web site characterizes the campground use as “light”. I’m not certain what metrics they use to make that measurement, but it’s seemed full to me, or nearly so, for the 3 days I was there before writing this review. 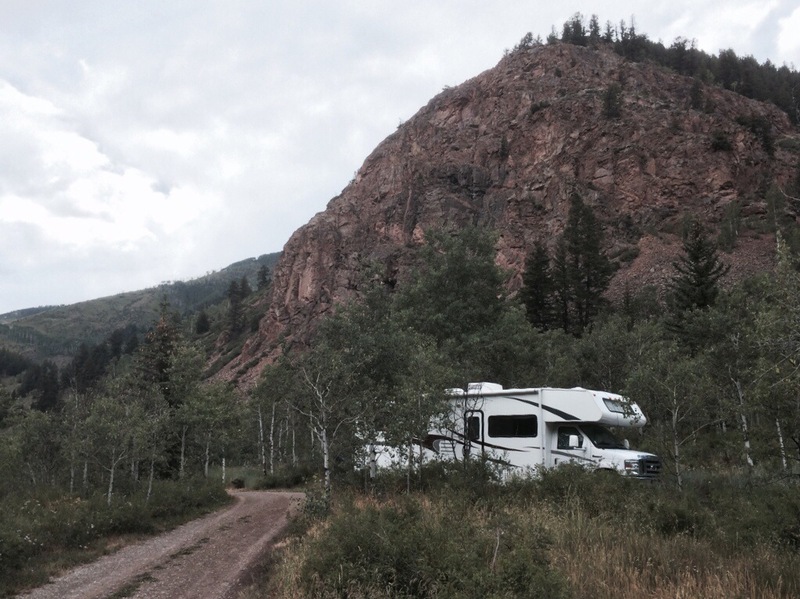 The campground is set in a narrow canyon within a mixture of Aspens and evergreens and various shrubbery and flowers. Some sites are suitable only for tent camping. Most of the sites along the creek, #3 – #9, are well shaded. Some sites are fairly level while others are not. This may make what would otherwise be a site suitable for RVs, unsuitable. I saw two sites that could, and in fact were, accommodating Class C coaches in the neighborhood of 30′ (including my own coach) and they could handle RVs a little larger. I was in space #1 with my 32′ rig and there was maybe another 20′ of usable space. It may have been the longest site of all. Sites, which are dirt or grass have picnic tables, metal fire rings and tent pads some of which are gravel. There are no hookups. There is no water, apart from Cement Creek itself (see notes above)\. I’ve noticed access to the creek via some of the campsites, but have not checked for access that does not go through somebody’s camp. The campground does have vault toilets and dumpsters for trash. Cement Creek Road had what I considered to be a surprising amount of traffic, meaning a vehicle might pass every few minutes during the day. Just past the campground, on the left side, roadside, was a potential dispersed campsite that could handle a good size rig. I almost took that site but opted not to because of the dust raised by traffic and its more public nature than the campground. There was also a large turnout on the right which might serve as a place to overnight-it if need be. I drove beyond those sites for some distance looking for others and I saw one or two close to Cement Creek campground that may have been OK for small, pick-up camper style rigs . The road gets narrower and steeper pretty soon past Cement Creek Campground and I wouldn’t think a good idea to head up that way with a rig of any larger size. I did ride on for a few miles on my motorcycle and passed a small residential area with a handful of houses roadside. Beyond that I came upon some dispersed campers including an Airstream, a pickup camper and maybe another trailer or two, but I don’t know if they arrived there from the south end of 740 or the north. THE MVUM (Motor Vehicle Use Map) issued by the Forest Service shows 740 continuing past the campground maybe 8-10 miles and dispersed camping along much of that route. I should note that dispersed camping is not indicated on the map as close as the two spots just beyond the campground that I mentioned above. Whether or not it’s lawful to camp there I don’t know and I’d say to check with the Forest Service. The town of Crested Butte South at the south end of 740 where it meets 135 is a small residential community with a few businesses including a cafe/general store/gas station combo. Don’t expect to find much at all in this store as it didn’t have much more than pancake mix, soda and candy bars. I didn’t check the menu about the food served. Expect the hours to be limited. There is also a little coffee shop in town, Camp 4 Coffee. They roast their own coffee and the cup I had was great. They had a few pastries as well. My donut seemed perhaps day-old. They have very limited hours of 5AM-noon, during the summer. Crested Butte, to the north along 135 maybe 10 miles, is a town of more significant size with restaurants, hotels, art galleries galore, a couple banks and gas stations, etc. Beyond that, a smaller town, Mt. Crested Butte in which I made no stops, then after the road turns to dirt as you travel north, the town of Gothic which, having but a handful of buildings is the smallest of all the towns mentioned. It gets a fair amount of traffic because of of the bicycle, horseback and hiking trails; the Rocky Mountain Biological Research facility which is headquartered there, and the wildflower viewing for which the Crested Butte area is known. A sign on the visitor center proclaims Crested Butte and Mt. Crested Butte the Wildflower Capitol of Colorado. I didn’t realize the wildflower population had a government. Nevertheless, the area is a lovely part of Colorado: very picturesque, with lots of outdoor enthusiasts coming to visit. During the winter I take it there is some skiing in the vicinity, but Cement Creek and other campgrounds are closed that time of year.